Communion Packs a Punch | GetAlongWithGod.comGetAlongWithGod | A blog about discovering a God worth knowing. I almost had a “Monday, Monday” kind of Monday yesterday. Everything lined up perfectly to produce a day that would begin and end in tears of discouragement, but God had other plans for me. Instead of giving in to the seeming reality of a bad day, the Spirit led me to take communion, and that changed everything. My alarm clock died while I slept, so I slept in…and how! I awoke feeling strangely rested in a lighter than usual bedroom. The combination of sunlight and a black screen in place of the digital display of time caused my adrenaline to spike and a shriek to erupt out of my now churning stomach. This is a truly unpleasant way to start the day. Instead of coffee and quiet time, a mad scramble to shower and get to work ensued. Have you ever noticed that the faster you try to get ready, the clumsier you become, thus taking longer than you would have if you just approached your tasks at normal speed? Might just be me. Needless to say, I was a mess. I got to work ten minutes late with wet hair, no socks, and a heart full of panic and despair. My mind moved like a hamster freshly injected with methamphetamine and made almost as much sense. In the midst of the hysterical clamor of self-recrimination and growing defeatism, a word broke through: communion. Suddenly I knew that I had to take communion. I was desperate for it! This was the solution. 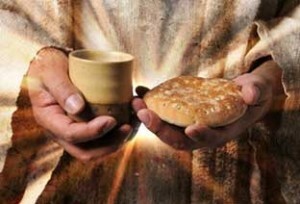 Let a man [thoroughly] examine himself, and [only when he has done] so should he eat of the bread and drink of the cup. Communion is intensely relational to me. I pour my heart out to Jesus Christ, and then He is poured into me. I confess every doubt and darkness that roils my heart, mind, and spirit, pushing it out into the Light, and then I run to the Body and Blood of my Lord. Immediately after taking communion, the battlefield of my heart and spirit is empty of the enemy. It’s just Jesus. No fear, no hate, no doubt. Just Light and Love and overwhelming gratitude. I am free. I haven’t even cracked the great mystery of communion, but the miraculous result speaks for itself. I do not take it lightly; I take it desperately. And yesterday, communion reset my whole day. I was focused and hopeful and had joy and peace. Though I take communion fairly regularly, this was not my typical response. In fact, it would not have been abnormal for me to give in to the wretched circumstances and spirit of despair. I’m sorry to say that quite a few Mondays found me simply praying for the grace to get through the day, to endure the failure that I had brought down on myself. This is new and I love it! It’s not enough to endure the hits when they come; I am NOT just a punching bag with legs called to hack her way through a series of failures great and small. I aim to overcome! I’m meant to overcome. This life is precious, every day of it, and I’m tired of conceding whole days to the enemy’s machinations. If Jesus wants to take a day, they’re His to take. Satan doesn’t have that right. Communion blasted me out of the accuser’s kill zone and into the presence of the Father and the Throne of Grace. An otherwise ordinary day was made eternally significant with its victory and I find myself looking forward to the next “Monday, Monday” kind of day that Satan tries to foist on me. Like yesterday, I’ll end the day in tears, but they’ll be tears of gratitude and joy, and that’s a win. Jennifer…thanks for sharing this…words fail to express the blessing it brought as I read it. God uses you and John in powerful ways through this blog…especially through your vulnerability and transparency. You guys write about LIFE that we all experience, but few of us ADMIT TO! I don’t comment very often but I’m ALWAYS blessed in the reading of them! THANK YOU for your obedience and faithfulness! Wow… this is just precious, as Tammy said.